I wrote last week about the difficulties of finding reasonable health insurance as an individual, one of the pains of entrepreneurship. An even larger problem to overcome once you’ve found the right health insurance maybe overcoming being denied health insurance as an entrepreneur. Turns out having a fractured elbow, even after it’s all healed, can be a real problem for future health insurance applications. I recently applied to Optima Health, a regional non-profit with decent reviews (despite being #133 on Consumer Reports, it’s the best-rated available in Virginia for a PPO). I was subsequently denied health insurance by Optima. Turns out I was rejected due to a “Broken Elbow” which occurred way back in July, 2011 and has since fully recovered (confirmed by an orthopedic doctor). 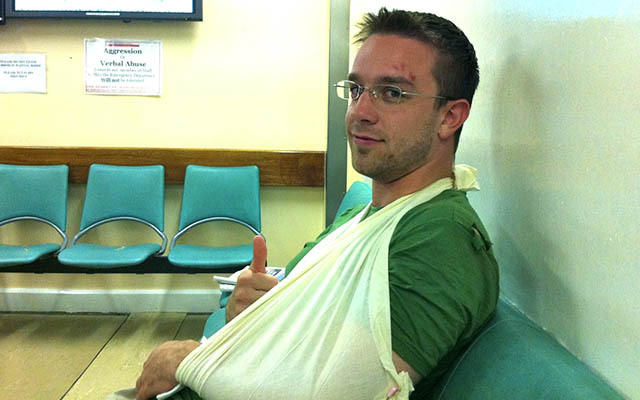 I even managed to fracture it while in Ireland which made for an interesting trip down Ireland’s healthcare system. I spent about half of a day at Kerry General Hospital after a mountain bike spill. The experience yielded some great interactions with the Irish that I’ll never forget. It’s such an incredibly sweet and hospitable country. After some initial examination, cleaning, sling setup, and x-rays – the doctor determined that I had fractured my left radial head. They ended up setting my arm in a cast for 24 hours where I returned the next day for an appointment to remove the cast, position the arm in a proper sling, and sent me on my way with a prescription for painkillers. It made for a fun flight home, but the whole experience cost me out-of-pocket…$300. With no additional insurance coverage (the $300 was just a chunk of my deductible). What would that have cost in the US? Some quick Googling yielded prices of around $2,000 to examine, cast, and x-ray for a broken elbow. I returned to the US and had a local orthopedic doctor re-examine it and suggest rehabilitation, fortunately I was quick-healing and little was required. Like many folks, I was under the impression that the recent “Affordable Care Act” (or “Obamacare” as it’s become somewhat derogatorily known) had phased out pre-existing conditions. Turns out, according to the provisions, that will not be fully enacted until January 2014, although it is active for children (the HealthCare.gov site actually has a great timeline to understand how various provisions are enacted over time). Until then, it looks like I’ll be digging into the issue of obtaining affordable coverage as a small business and entrepreneur. I’m certain things will work out, and there’s always COBRA. Maybe I’ll just have to fly to Ireland whenever I’m feeling a little queazy or decide to take a tumble. I’ve learned a lot about selecting health insurance as a self-employed person. There’s been a lot of pitfalls along the way. The process is opaque and at stake is not only your health but your wealth. I’ve compiled what I’ve learned about obtaining health insurance as a person without a direct employer into a handy guide. I hope it helps you learn what exactly a PPO, an HMO, and a POS is. Not only that, it aims to teach you how to select the best health insurance for yourself when you don’t have an employer to provide it.